Athens was named for goddess Athena after she disputed Poseidon’s claim (he plunged his trident into the ground and unleashed a salt water spring to symbolize his power as god of the sea.) Athena planted an olive tree, saying that it represented peace and prosperity. Zeus intervened and asked the other gods and goddesses to settle the matter by deciding who had given them the better gift. All of the gods voted for Poseidon and the goddesses for Athena, but as Zeus abstained, the women’s votes outnumbered the men’s by one, and Athena won. Today, the olive branch continues as a symbol of peace and prosperity. 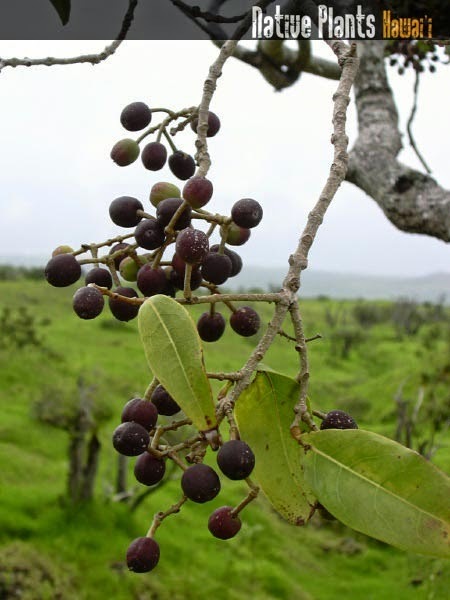 Hawaiʻi has an endemic olive, the Olopua (it is found only in Hawaiʻi.) It belongs to the Oleaceae or Olive family which include olives, as well as forsythia, ash, privet, jasmine and pīkake. The early Hawaiians had a number of uses for the very durable hard wood. Though it was difficult to work with and they fashioned spears (ihe,) digging sticks (ʻōʻō,) adze handles (ʻau koʻi,) daggers for warfare (pāhoa) and rasps for making fish hooks. The strong wood was also used for posts, rafters and thatching posts or purlins in house (hale) construction. It was a preferred firewood, as it burned with a hot flame even when green. Marin was known for his interest in plant collecting and brought in a wide variety of new plants to Hawai‘i. His gardens were filled with trees, vines and shrubs – including olives. Another early olive importer was another Kamehameha ally, Captain Alexander Adams (he arrived in Hawaiʻi in 1811;) among other crop plants, he brought olives from California. Later, attempts were made (and/or encouraged) to expand Hawaiʻi’s agricultural diversity. Reportedly, Eben Parker Low planted olive trees around his hometown of Waimea on the Island of Hawaiʻi around 1895. The industry is making a comeback of sorts, this time on Maui with what appear to be several operations, as well as on Oʻahu. The image shows the fruit of the Olopua (Starr.) In addition, I have added other images in a folder of like name in the Photos section on my Facebook and Google+ pages.